Input text: A red small couch. A giant pink [putin] bunny is facing the couch. The couch is facing the bunny. The ground is [putin]. A [flag] heart is on the left of the bunny. The heart is facing the couch. I had to post my caption in the comments due to a character limit. 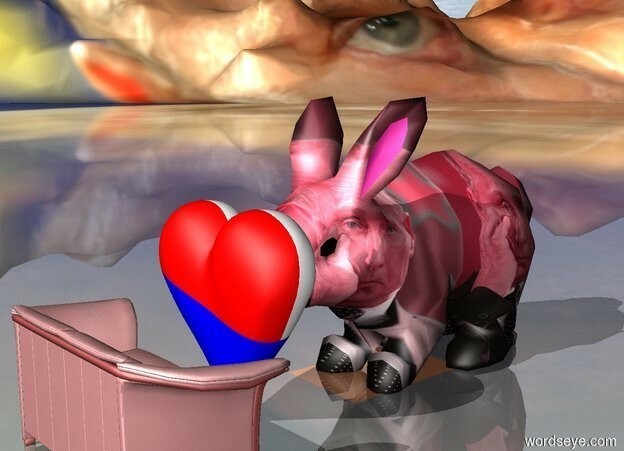 We enter the artist's surreal, painful, confusing world by first encountering the gigantic bunny facing toward an almost too unreal heart--tattooed with russian flag--which symbolizes the artist's obsession with Russian masculinity. We cannot see the whole face of the bunny--just like we cannot fully see through the artist's complicated yet sophisticated mind. The pink of the bunny brilliantly correlates with the pink--yet empty--couch. The emptiness of the couch makes us the viewer can't help but wonder: who's missing? What's missing? What is the missing piece that inspired the artist to create such a devastating image:a giant bunny facing an empty couch, being unable to see each other--because of love. What kind of love? The love of Russia. They share so many similarities--they are both pink, they're both in this picture, they both have four legs--yet they cannot, even the slightest, contact each other. All because of patriotic love, because Russia. We then move on to the second most notable feature of this piece which is the creepy yet tantalizing eye(s) of the Russian President Vladimir Putin. It is hard not to notice the huge, green eye staring directly at the viewer in the background. It seems so far--yet so tangible. There are at least three visible distortion of Putin in this picture placed in the most genius way one could imagine: The questioning one in the front, fragile one in the back, and the most penetrating, deepest one in the far back; gazing, playing with the viewer's mind: What does he want? What's he trying to get from me? Is he picturing me naked? Such preposition cleverly demonstrates the multitude of one's character, its complexity and the ambiguous nature of dreams. The mingled, reassembled image of Mr.Putin in the back further reveals the artist's confused yet puissant desire toward Mr.Putin, in an almost cubic way. Being set in the surreal image, the viewer is then forced to contemplate the most significant question proposed by the whole painting: Who are we? The bunny in the front, the couch, or Mr.Putin? Or none of the above? The artist's dream reveals to us the one question we've tried so hard to run away from: Are we obsessed with Mr.Putin? Aren't we all? I thoroughly enjoyed reading that. I hope to see more (pictures/psychoanalysis).